New Rochelle, NY, August 13, 2018–Platelet-rich plasma (PRP) is believed to provide pain relief and help improve joint function in degenerative joint disease, but a new study has shown that it does not act by promoting stem cell proliferation or enhance the cartilage formation capabilities of mesenchymal stem cells (MSCs). The effects of PRP treatment on cartilage formation and chondrogenesis in the presence of adult human MSCs derived from two different sources are reported in the study published in Tissue Engineering, Part A, peer-reviewed journal from Mary Ann Liebert, Inc., publishers. Click here to read the full-text article free on the Tissue Engineering website through September 13, 2018. In the article entitled "Effect of Platelet-rich Plasma on Chondrogenesis of Adipose- and Bone Marrow-Derived Stem Cells," coauthors Jr-Jium Liou, Benjamin Rothrauff, Peter Alexander, and Rocky Tuan, University of Pittsburgh School of Medicine (PA), used MSCs derived from the fat pad of the knee and from the bone marrow. They showed that high concentrations of PRP treatment for long periods of time actually impaired cartilage formation, making it less likely for chondrocyte differentiation from the MSC to occur. This had important implications for the development of future strategies to repair cartilage damaged by injury or disease. "This article presents a systematic study to elucidate the effects of PRP on the chondrogenic differentiation of adult human MSCs and its potential mechanism of action as a therapeutic adjunct for the treatment of joint diseases," says Tissue Engineering Co-Editor-in-Chief Antonios G. Mikos, PhD, Louis Calder Professor at Rice University, Houston, TX. Tissue Engineering is an authoritative peer-reviewed journal published monthly online and in print in three parts: Part A, the flagship journal published 24 times per year; Part B: Reviews, published bimonthly, and Part C: Methods, published 12 times per year. Led by Co-Editors-in-Chief Antonios G. Mikos, PhD, Louis Calder Professor at Rice University, Houston, TX, and John P. Fisher, PhD, Fischell Family Distinguished Professor & Department Chair, and Director of the NIH Center for Engineering Complex Tissues at the University of Maryland, the Journal brings together scientific and medical experts in the fields of biomedical engineering, material science, molecular and cellular biology, and genetic engineering. Leadership of Tissue Engineering Parts B (Reviews) and Part C (Methods) is provided by Katja Schenke-Layland, PhD, Eberhard Karls University, Tübingen and John A. Jansen, DDS, PhD, Radboud University, respectively. Tissue Engineering is the official journal of the Tissue Engineering & Regenerative Medicine International Society (TERMIS). 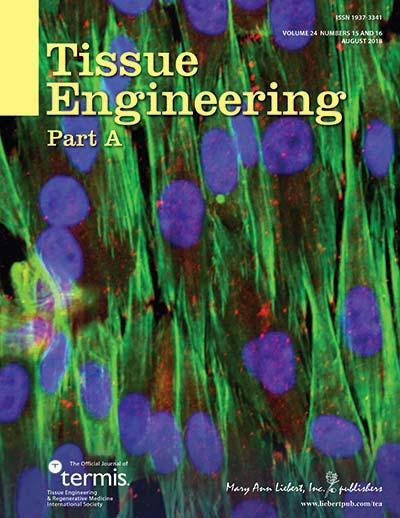 Complete tables of content and a sample issue may be viewed on the Tissue Engineering (https://home.liebertpub.com/publications/tissue-engineering-parts-a-b-and-c/595) website.